The Line 1 is one of the very important lines of the Vaporetti (Italian name for water buses) in Venice. It is especially suitable for tourists who want to see much of Venice during a boat trip. You make slow progress because of many stops, but you see many sights. Almost all the big attractions of the city can be reached with the water bus line 1, including St. Mark's Square (ferry stop San Marco), the Rialto Bridge (Rialto), etc. A trip with this public ferry line is ideal for taking pictures. The train station (Ferrovia) and bus station Venice incl. tram (Piazzale Rom) are also served by line 1. Line 1 runs in both directions. The ships simply return from the two terminal stops in the other direction. If you are standing at a water bus stop and get on a ferry of the line 1, you must always make sure that you go in the right direction. Of course, this does not apply to the two end stops, but for all the others, there are approximately 20 stations. One of the two final stops is the "entrance of Venice", the Piazzale Roma. It is the only stop for all buses and trams from the mainland. You can also only drive here and park in one of the expensive multi-storey car parks. The other terminus is the island of Lido. The route of the vaporetto line 1 can be easily described. The vaporetti go through the whole Canal Grande and then even further to the nearby island Lido and back again the same way. The Line 1 can be described as a slow train, because it stops very often. The Canal Grande of Venice is approximately 4 km long, the water buses of this line stop approximately 18 times in the canal, thus approximately every 200 metres. As there are only 4 bridges over the Canale Grande, the vaporetti stop sometimes on one side, sometimes on the other side of the big canal through Venice. Thus, it is also important to get off at a station on the right side, some locals and tourists even take line 1 only for one station in order to cross the Canal Grande. But there are also some small, cheap gondolas (50 cents) at some places that take the passengers over the Canal Grande. The vaporetti of line 1 are well filled despite frequent departures. Station 1: Piazzale Roma. Almost all visitors to Venice who do not come by train (i.e. by car, bus or tram) arrive here. Station 2: Ferrovia Venezia: Venice Central Station (Stazione Santa Lucia). This is where all trains arrive (long-distance and local services). Between Piazzale Roma and the main station you can also walk over a new bridge in 5 minutes. Important this vaporetto station 2 is called Ferrovia (ferro=iron, via= path or way, so simply translates ironway). Station 8: Rialto. Venice's vaporetto line 1 stops next to one of the most famous bridges in the world, the Rialto bridge. Here, it is not so important on which side of the canal one gets out, as you can simply cross the Canal Grande the Rialto bridge. Station 16: San Marco. Besides St. Mark's Square there are many other top 10 sights of Venice. These include St Mark's Basilica, the bell tower and the Doge's Palace. St. Mark's Square is the centre of Venice. Station 23: Final station on the island of Lido. The majority of Venice tourists do not travel that far. But there are many hotels and campsites on the island of Lido. The total travel time of line 1 is about 65 minutes. So it is a real slow "train". With other waterbus lines, you can travel much faster on the same route. On the Canal Grande, this is above all line 2. In contrast to the slow train of the Line 1, this could be described as a fast train. The journey time is clearly shorter by substantially fewer stops. Piazzale Roma (bus, tram, parking area in Venice) to Santa Lucia train station (Ferrovia): 3 minutes (only 1 stop), walking distance is very short. The travel times often differ slightly. The traffic time of the line 1 is about 5 o'clock in the morning until 23 o'clock, there are also night water buses with other line names on the route. Frequency: During the day the vaporetti of line run about every 10 to 12 minutes. A single ticket for the water buses of line 1 in Venice costs at least 7.50 euros for one person (as of early 2018). This is very expensive. There are also other tickets. For almost all tourists, a day ticket or, much cheaper, a multi-day ticket is therefore worthwhile. These Venice day tickets are valid for any number of trips during the validity period on almost all public ferry lines (not to the airport). These day tickets and multi-day tickets for the vaporetti can be bought easily on the following website on the Internet. 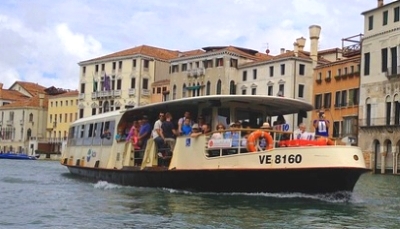 The video (duration 1.5 minutes) shows a vaporetto ride on the Canal Grande.